Richmond (United States) (AFP) - A presidential campaign rally for Republican frontrunner Donald Trump gave way to pushing and shoving as the billionaire's supporters clashed with a group of Latino student protesters. Around a dozen students tried to interrupt Trump, who had just began his speech at a Richmond, Virginia rally, shouting "We're here to stay," and "Dump Trump." Members of the crowd snatched their signs and began shoving, in an episode that lasted several minutes. "Go back where you came from!" one supporter shouted. 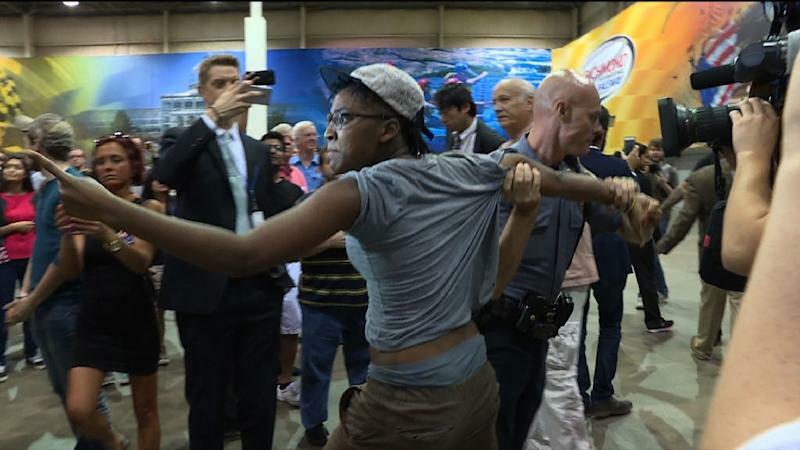 At another point, a rally attendee spit in a protester's face. Trump, a billionaire real estate developer who has never held elected office, continued his speech over the ruckus and later told AFP that he "didn't see much of the protest." "We have thousands of people in this room... We have about ten people over there. They'll get the headline," he lamented during the rally. The student protesters, who were from Virginia Commonwealth University in Richmond, said their aim was to call Trump out on racial and immigration issues. "We just had to show him that here we don't stand for racism. He's just playing on xenophobia and hatred towards people from minorities", one protester said, after being escorted out by police. She added that no one was arrested or hurt. Trump has promised that if he wins the White House, he will expel immigrants who are in the United States illegally and build a wall on the US-Mexico border. Trump's incendiary comments on immigration and other issues have dominated the nascent 2016 election campaign.